#SoulHeartedLiving ~ A call to come home to your heart! I hope 2019 has started off rocking amazing for you! One of the things I have found to be most helpful on my journey ARE TOOLS! My dear friend Dr. Debra Reble has graced us with her brilliance once again!!! Mantra's and affirmations are so powerful ~ I use them all the time! That is why I am SO thrilled to be apart of this amazing project and beautiful book! The cover is FABULOUS!!! As women, we can all use a daily touchstone to help us stay connected to our heart wisdom, remind us of our truth, and align us with our Divine purpose. The new book, Soul-Hearted Living: A Year of Sacred Reflections & Affirmations for Women, by Inspired Living Publishing, offers you that touchstone. What an honor it is to have contributed some of my original inspirational quotes to this beautiful project. This uplifting 365-day book of sacred reflections from Intuitive and Spiritual Psychologist Dr. Debra Reble—the award-winning, International Best-Selling Author of Being Love and Soul-Hearted Partnership—invites you to pause, reflect, and rejoice. You'll get centered and grounded through each day’s lesson before meditating on an uplifting positive affirmation. Along with this daily wisdom from Dr. Debra, you’ll also tap into the feminine wisdom of original inspirational quotes from women in her sacred community, including some of today’s leading luminaries. Soul-Hearted Living invites you to embrace your courageous heart, tap into the wisdom of your soul, and see the beauty in all aspects of life so you can love yourself and others through it all—one day at a time. The perfect gift for the women in your life. A dream come true! My story is in SHINE! Today is a big day for me and your support would mean the world to me! Today’s the official release of“SHINE! Stories to Inspire You to Dream Big, Fear Less & Blaze Your Own Trail”, published by Inspired Living Publishing! I’m so excited to be a contributing author in this soul-nurturing project along with twenty-three other women. I’m jumping up and down to share that New York Times bestselling author, world-renowned speaker & retreat leader KRISTINE CARLSON wrote the foreword. All of the inspiring stories in SHINE! are from women, like myself, who have chosen to shine in their lives―to be their own North Stars, to be their own guiding lights. We share the moments when we decided to take off our masks and stop playing small in our lives, relationships, missions, health, and work. These moments―whether big or small, momentous or quiet―triggered a landslide of change that brought down the walls behind that we had each been hiding. Our collective vision is that our stories will inspire YOU to dream big, fear less and blaze your own trail. ** Own Your Gifts: Sometimes, you don’t even know how amazing your innate gifts are until life forces you to use them! ** Sing Your Own Song: There are many ways to use your voice, but few are more vulnerable than singing! ** Go Your Own Way: Sometimes, in order to be your greatest self, you need to make choices that others don’t understand and to stand in your truth despite what is happening around you. ** Trust Your Inner Knowing: When you listen to the whispers of your heart you blaze your own trail to joy, success and fulfillment. ** Claim the Spotlight: Shining brightly in your life often means letting go of old beliefs and taking the stage in a bigger way than ever before. ** Embrace Your Empowerment: Despite what you’ve been through, you can claim your inner sovereignty and stand tall in your truth. ** Believe in Miracles: When you trust that you are cared for and protected, you can show up in a way that’s bigger than your fear. Every woman’s sacred story is followed by three Reflection Questions to guide you deeper into your own truth. Each of us is a supernova in disguise, a brilliant light that can illuminate the world. Let the powerful stories in SHINE! show you how you, too, can let your light shine as a beacon in your own life, and the lives of others. P.S SHINE! is the perfect inspirational gift for the women in your life. We often talk about the clutter in our homes and how it takes up space energetically. BUT have you thought of the clutter you may be holding onto internally? When we experience emotions good or bad, and we hold on to that energy it can create discomfort within the body. This can show up as physical discomfort, anxiety, depression, stress, and unwanted feelings or states of being. Do you ever feel your throat getting tense when you get upset? Tears that want to flow but instead you hold them in? That is exactly what I am talking about! We can’t hold onto that energy or we will end up full of “clutter” preventing us from experiencing the joyful lives we are meant to live! When we learn to channel our emotions and turn that energy into a different form, we can allow it to move through us and let it pass. “Energy is neither created or destroyed, only transformed”. Out of all the major organs and functions that the body can perform without us even thinking about it, the breath is something we can control. We can manipulate it to excite us, or to calm us down. In sanskrit, “Prana” means breath, it is our life force energy. When a baby comes into the world, the first thing that happens is they gasp for breath, and when we leave this physical world, we do so by exhaling our final breath. The ancients believed that the more control we had over our breath through meditation and yoga practices, the easier it was to remain present in the moment and channel through those emotions so we could be free from discomfort, and experience a happier state of being. Have you ever comforted your child, a friend, or a loved one when they were upset or experiencing a panic state? Do you often find yourself saying just take some deep breaths, calm down, just breathe? I think we all have at some point. That is exactly where you can start to begin to use your breath in your own situations. By simply just breathing and exhaling we can begin to calm ourselves and our thoughts so we can enter a state of response to the threat or emotion versus reacting to it. Now, this does take practice, but it is extremely effective! Now what about the thoughts that create clutter in our minds? What is that voice in your head saying to you? Do you believe that voice? Or do you recognize it isn’t you and if you take a step back and simply observe what it is saying perhaps you will recognize it is saying things that aren’t so positive and loving all the time. Each day we have an average of 50,000 - 80,000 thoughts, and we are consciously only aware of about 1% of those thoughts. Our thoughts have the power to create our reality and re-wire our brains! It is actually pretty amazing! So this practice of mindfulness and how we choose to speak to ourselves becomes so important to designing a life you love! Mantra comes from the sanskrit language, it is made up of two words “manas” meaning mind, and “trai” an instrument or tool (for your mind). We can use mantras as tools to help with the clutter in our minds in a meaningful or meaningless way. The ancients also believed that we could use mantras to connect with the invisible vibrational sounds of the universe. Repeating sounds creates a physical vibration. Regardless of what type of mantra we are using, we need to be clear on our intention so we can choose the mantra that is best for the situation. Perhaps you are a runner so a mantra such as “I have strong legs and can run like the wind” can be useful when you come to a steep incline and begin to feel discouraged. Maybe each day you wake up you look at yourself in the mirror, right in your own eyes and say “I am beautiful, I am loved, I am amazing”. Or perhaps we want to connect to the vibrational sound of the heart, which allows us to receive and give love unconditionally. We can chant the sound "YAM" or "YUM", to open up our heart centre and become more connected to giving and receiving. Maybe, we just long to sit in stillness and quiet our thoughts, we can use a meaningless mantra such as "SO-HUM" to create a point of awareness, but it has no meaning at all. With any mantra or affirmation, know that your mind will wander, it is normal to do so, and when this happens and you become aware of it, simply bring your awareness back to the repetition of the mantra. Be gentle, and be kind to yourself, as the ultimate goal is to remove the internal clutter that is holding us back from living a life we truly desire. Using these tools is one action step we can take to move our energy and bring us back to being in the present moment. If you are new to meditation and mindfulness practices I invite you to download my FREE 10 Minute Mini Vacay Meditation as my gift you! I’ve got some exciting news to share with you! 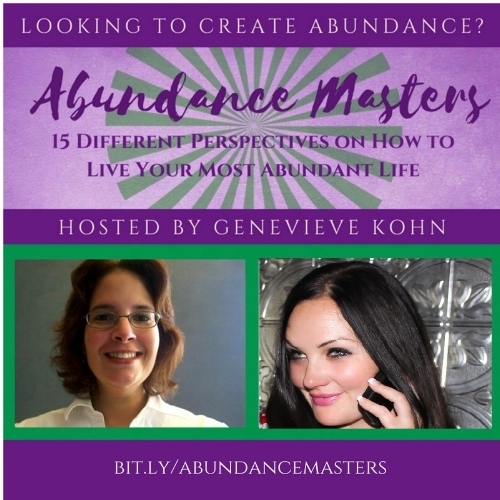 Not long ago, I connected with Felicia Baucom, who is one of the most dynamic authors and coaches in personal development today. and how, even though everything seems great on the outside, they feel like they’re falling apart on the inside. after all, there are people out there who would be grateful to have your life, right? … and who want to live in alignment with their core values and goals. OF COURSE I wanted to share! without having to invest a single penny? Anyway, all you need to do is click on the link below and tell Felicia where to send your audios. giving you the perspective and techniques you need to stop just “going through the motions” and start actually living again! Plus you'll also receive a powerful collection of supportive gifts from me and my co-speakers! I can’t wait to hear what you think of the conversations! P.S. : As far as I know, there won’t be any opportunities to get replays if you miss out on registration. So I’d head over now and claim your spot before the next distraction comes along. Can Your Environment Influence Your Mindfulness? I had such a wonderful time chatting with Dr. Rachel Haviland and Genevieve Kohn about your environment and mindfulness on Reclaim Your Health Podcast! We touched on how to move and shift energy within your home. Become more intentional about the function of our homes and how to tap into all of your senses to create the environment that is most in alignment with you! Check out the conversation at Reclaim Your Health Podcast! Are You Ready to Design Your Juiciest Year EVAH? Here we are, another year has come and gone and we are just into the start of 2018! Whew...did that ever fly by! This is a time when we tend to focus on New Years resolutions and areas we would like to create change (or at least most do....). Has that ever really worked for you? If you really want to kickstart the year and make this your best, you need to get really clear on what your heart desires! Do you want to create more ease and flow in your life? Or simply just find time for you again? It doesn't matter what the transformation you are looking for is, big or small. What matters is you make that choice with intention! After having the privilege to work with some high level business coaches and successful entrepreneurs, I now choose a word of the year instead of a resolution. So what's my word of the year? Reinvent! My dear friend Cindy, publisher of Elements for a Healthier Life Magazine always says "Live life in motion". I love that because we are constantly changing based on our environment and experiences! So after a year of growth and learning its time to Reinvent some things! I encourage you to choose a W.O.T.Y. and give it a try! It will give you more clarity and a point of focus when "life happens". I'm always about sharing great resources! 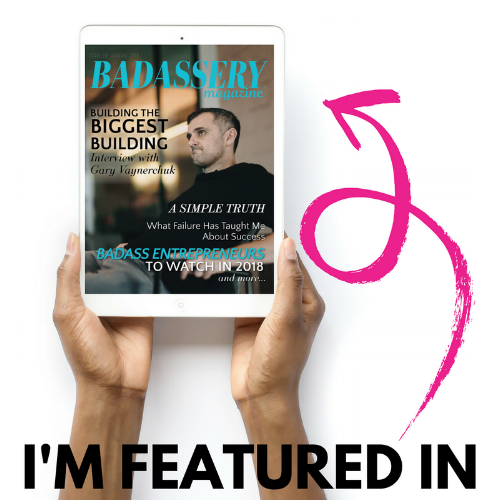 I am super excited Badassery Magazine just released their January issue, you should totally check it out!!! I was also very honoured and surprised to be nominated as a BADASS Entrepreneur to watch in 2018!!! Thank you and cheers to 2018! Happy New Year! I'd love to know what your word of the year is! Share in the comments below! Cheers to 2018 and your Juiciest year EVAH! Celebrate with me! My new book Courageous Hearts is here! “True feminine courage isn’t loud, or brash. It doesn’t scream from the rooftops. 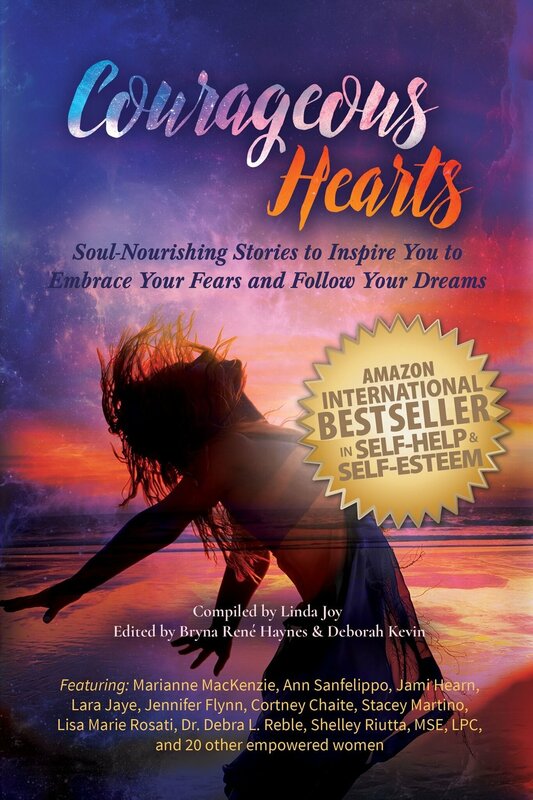 It’s launch day for “Courageous Hearts: Soul-Nourishing Stories to Inspire You to Embrace Your Fears and Follow Your Dreams”, published by bestselling publishing house, Inspired Living Publishing! I’m so excited to be a contributing author in this powerful project along with twenty-nine other women. I share one of the most intimate, and vulnerable moments, of my life in my story, “Everything Happens For A Reason” to inspire all women to step through their fears and embrace their courageous heart. The thirty stories in Courageous Hearts, including mine, are stories of breaking through the barriers we impose upon ourselves so that we can choose love and empowerment over fear and constriction. They are stories of love, of loss, of healing, and of surrender. They are stories from women who found the strength to do what their hearts were calling for, and whose lives, and dreams, blossomed as a result. They are stories by real women, for real women, and they glow with a beauty beyond mere words. P.S Courageous Hearts is the perfect inspirational holiday gift for the women in your life. Order multiple copies today to give as sacred gifts! P.S.S. SHARE THE LOVE! Please share the following post on Twitter and Facebook.